If you’ve looked at my schedule recently, you’ve probably noticed than fully 2/3 of my classes are less than an hour long, and I have two very good reasons for that! Reason #1 – I want to give you your time back and make fitness more accessible to everyone. 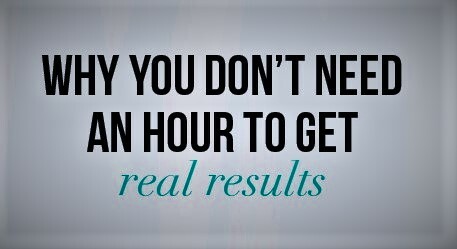 The number one excuse for not getting a workout in is, “I don’t have the time.” I get it! By the time you get ready, drive to the studio or gym, attend your hour-long class, drive home and clean up, that’s probably closer to 2 hours! Who has that large a chunk of time in their day, 3-5 days per week, 52 weeks out of the year? Reason #2 – All the current research is showing us that shorter, more frequent workouts will have a much greater positive impact on our lives than longer, less frequent workouts. It’s about how much you move in total throughout your day, not how much you move at one go. Even if you get in a long workout in the morning, if you spend the rest of your day sitting, your workout is pretty much completely negated. Think of it this way: sitting is the new smoking! Current movement guidelines for adults call for us to get 150 minutes of moderate-intensity aerobic activity (i.e. brisk walking) OR 75 minutes of vigorous-intensity aerobic activity (i.e. jogging or running) each week. As an aggregate, that means that’s just three-to-five 30-minute classes per week! Of course, more time equals more health benefits, but the good news is that it really goes all add up, even if it’s just 10-minutes at a time throughout your day. Want some more info on how more movement matters and how bad sitting all day is for you? Don’t just take my word for it! Click here, here and here. P.S. Don’t forget muscle-strengthening too. Current guidelines call for you to work all major muscle groups at least 2 days per week. Aerobic activity is great, but you need strengthening too!